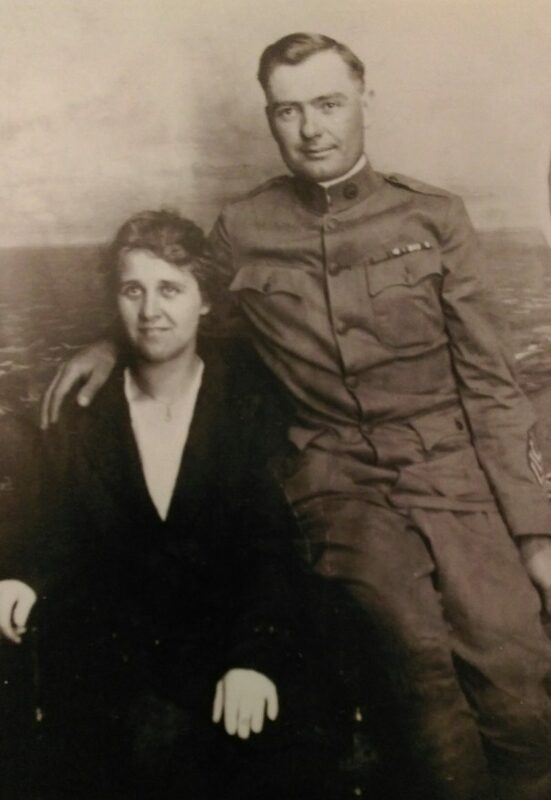 According to Jefferson City, Mo., resident Roman Borgmeyer, while growing up, his father shared with him a story about an unexpected event that inspired his service in the U.S. Army—a decision that brought him face-to-face with the horrors of trench warfare and fighting against a country from which he was only a generation removed. Though the accuracy of such accounts are occasionally diminished when filtered through generations of family retellings, records exist that can help substantiate the histories of those who have served the state and nation during conflicts long ago. Born on November 8, 1892 in Westphalia, Mo., William Borgmeyer was the son of Henry Borgmeyer, the owner of the orginal Westphalia Hotel. According to census records from 1900, Henry was also a saloonkeeper and a first-generation U.S. citizen, as his father had emigrated from Germany. Military service records accessed through the Missouri State Archives indicate that on November 30, 1915, William Borgmeyer’s military service began when he enlisted at Jefferson Barracks, Mo., and was later assigned to Battery F, 6th Field Artillery Regiment. Records maintained by descendants of William Borgmeyer reference his service during this campaign, including a photograph of the young Army private standing next to his horse while deployed along the Mexican border. But for a young man supposedly trying to escape the peril associated with his previous work at the state Capitol, he would soon find himself part of one of the deadliest conflicts in global history—World War I. As noted by the U.S. Army Center of Military History, the 6th Field Artillery Regiment was attached to the 1st Expeditionary Division (which was later designated as the 1st Division) on June 8, 1917, two months after the United States made a formal declaration of war against Germany. “I still have dad’s service medal and it shows that he participated in five major campaigns during the war,” said his son, Roman. Borgmeyer’s service card states that his overseas service commenced July 30, 1917 and continued nearly two years. The soldier’s discharge lists participation in major operations such as the Battles of Cantigny, Soissons, St. Mihiel, and the Meuse-Argonne offensive—the latter of which resulted in a condition that would haunt Borgmeyer for many years. The last major battle of the war, the Meuse-Argonne Offensive involved 1.2 million American troops and, by the time it ended on Armistice Day (November 11, 1918), resulted in the death of 26,000 men. Although the division was able to defeat “in whole or part, eight German divisions,” the 1st Division Museum cited, Borgmeyer was severely wounded when gassed on October 5, 1918. 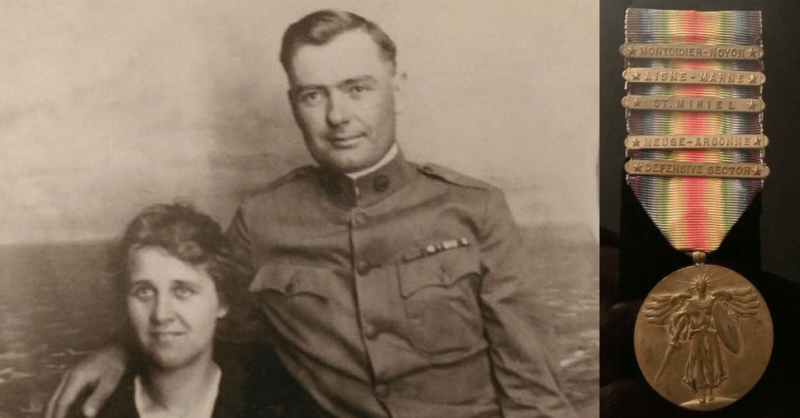 Corporal Borgmeyer remained in the miltary until receiving his discharge at Camp Funston, Kan., on May 28, 1919, only to return home and discover that his mother passed away two months earlier. He soon embarked upon his chosen profession as a farmer in Osage County and, in 1920, married Elizabeth Jurgensmeyer of Koeltztown. William Borgmeyer passed away on April 26, 1985 and was laid to rest in his native community of Westphalia. Though he has been gone for more than three decades, his son clearly recalls the goodbye that occurred when he received his own draft notice, thus following in the footsteps made by his father in France more than a quarter-century earlier.